When I was still dating Arya, I remember talking to him about why I think certain relationships work and some don't. I have had my string of trials and errors, and although some of them are good people I couldn't bring myself to the 'I do' stage of a relationship. The lowest level, the primary, is the most basic indicator to compatibility. It is the values with which we view life. Two people need to share compatible values in order for the relationship to succeed. Within this level is usually the moral and ethical debate over right and wrong, what kind of person we strive to be, etc. 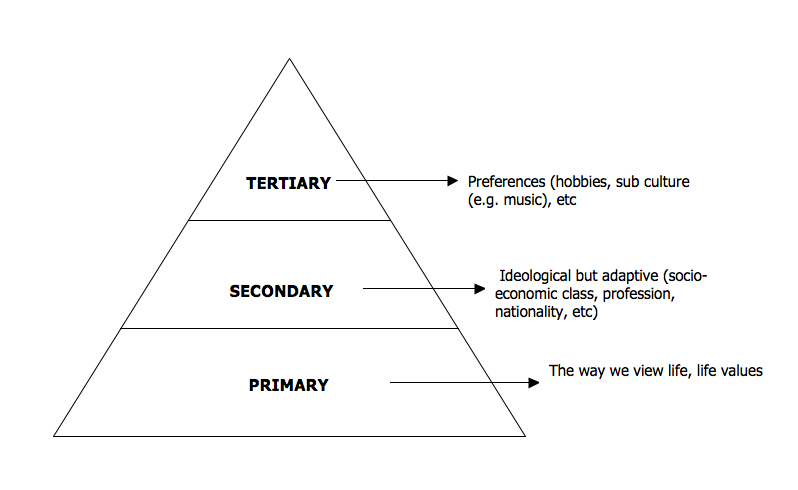 On the secondary level, you have social fragmentation. Socio-economic class, profession, and nationality are examples. Although they are ideological, they are less fixed than life values and they are adaptive to circumstances. The logic is: an Indonesian could adjust to life abroad but their moral indicators (primary) would stay the same. On the tertiary level you have hobbies. Music you listen to, sports, things you do in your leisure time. Usually our hobbies determine which sub culture we are part of. Movie buffs, geeks, TV addicts all emerged from the choice of past times but they shape sub cultures. Having said that, I argue that a relationship could only work if the couple is compatible in the primary level. Afterwards we work our way up the pyramid. A relationship can survive with just primary compatibility, but it would grow more intense if they're compatible on the secondary and tertiary level. This is why 'pernikahan taaruf' works. You wonder how is it possible that two people that have never met before could build an intimate relationship. It's because that is the basic values they believe in. They adjust the secondary and tertiary level according to their primary 'needs'. And that's also why the relationship of two people with the same profession and hobbies, which is so easily read externally as 'the most compatible couple since they can talk about work' could fail - because my argument is that they might not share their relationship on the primary, most important level. To be honest I made this model up based on my own personal experience and it's probably faulty in more than one context. But it's nice to conceptually explain why my relationship with Arya works. Cheers! intisari pembicaraan kita for the past decade? well, interesting point of view, Mbak Inaya. yet, I wonder why you pictured the elements in such pyramid. I questioned myself, "aren't people's ways of life cover larger spheres than hobbies?" it continued, "isn't it very common, when we see such pyramid, the more complex constructs are placed and put in the much larger area?" in my point of view, when you invert your pyramid, it will look fitter to the conditions or propositions upon which you are trying to tell us. i like the "pernikahan taaruf" argument very much! mungkin yg tahap primary itu contoh konkritnya memang agama, seberapa konservatif/liberal. gak menutup kemungkinan suku, terutama kalau di keluarganya cukup tertutup dan kuat menanamkan nilai2 itu dari kecil. menurutku keluarga memang penentu segalanya. seberapa jauh dia berbeda dari "roots"nya ketika tumbuh besar pada akhirnya akan balik ke situ. tp ketika nilai itu teruji dan gagal, dia bisa jadi kontra banget. Ninin, oh benar sekali. My interpretation of it is indeed religion (or our operationalisation of it). Jadi bukan hanya agama, tapi juga cara pandang dan cara implementasi agama. Bisa juga filsafat, etika, moral, dll (semua yang normatif dan susah diubah. Jadi kl tingkat keteguhan atas kesukuan tinggi, ya suku termasuk juga). Yuk, ngobrol. Aku tiap hari ke Depok huhu. Gilang, I edited the pyramid as per your criticism. Spot on. But... after the law requires marriage within the same religion, still I often heard the divorce cases. This proves the love is still a mystery. For me, marriage is one of life's journey. Therefore, it can be analogous to such a gamble. If you lose because of bad cards (divorce), accept your destiny, do not blame the card (your pair) or the game (our marriage), because yourself is also involved in the game (why you want to be a player). Hai Mas Tikno! Well, I would argue that although the couple are of the same religion, perhaps they don't believe in the same fundaments (atau alirannya berbeda). There is religion and there is religious views. Cheers! There's religion, and there's there's virtue, goodness and justice. I'm not so sure about your pyramid for the same reasons that Maslow's pyramid is also wrong. People have different needs from the three "food groups" or levels in the pyramid. For example, there are women who turn a blind eye to the husband's infidelity, corruption or violence because he fullfills needs from the second level and certainly from the third level. This is particularly true in environments and societies where outside pressure/indoctrination/coercion is at play. @Mauricio: Very, very true. Probably if I did a proper research, I'd find that the model only works for a certain social category. I'm also not convinced by Maslow's, but it serves as a sound, generic guideline to understanding the human psyche. Not so sure whay to comment. Not so sure why I'm writing this in the first place. Why people are trying to simplify scientific researches, you're doing the opposite. Intriguing.